It's a lovely Sunday and for those who are interested, a Horse is going to spell out what a push poll is and how it works courtesy of Wikipedia. In Australia's Northern Territory defined push-polling as any activity conducted as part of a telephone call made, or a meeting held, during the election period for an election, that: (a) is, or appears to be, a survey (for example, a telephone opinion call or telemarketing call); and (b) is intended to influence an elector in deciding his or her vote. "As city council president, Ravi saved the city’s hospital, saved 1200 jobs and protected taxpayers from a huge tax increase." In this push poll question, the objective is to see Councilman Ravi Bhalla elevated for "saving the city hospital" which of course is inaccurate among many people who worked tirelessly for hundreds if not thousands of hours without pay to do the impossible. Think the Hoboken hospital board members, especially, Toni Tomarazzo and the late Steve Rofsky who were central to this victory. In a push poll, highlighting that one council member on a body of nine credited he "saved the city's hospital" is an example of how such tactics may be used. 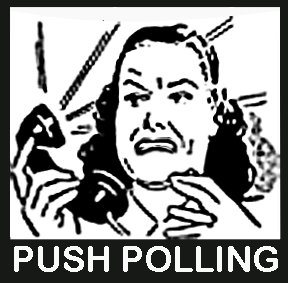 Push polling is generally acknowledged as a form of negative campaigning. 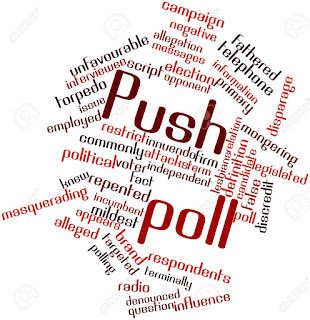 Campaigns can do polling and insert push polling questions to achieve a desired result; namely, the altering of voter perceptions favorable to a campaign. Related: MSV urges everyone to read the tribute to Steve Rofsky who was never properly credited by local media for his instrumental role in delivering the plan to save the hospital and with it Hoboken. Sunday Midday Update: MSV is pleased to present questions of the second Hoboken telephone poll, (not the Bhalla campaign's) courtesy of its readers. So without further adieu, details from the second telephone poll. 2. Are you employed by news media or a political campaign or volunteering for a local political campaign? 4. Is Hoboken going in the right direction/or is it on the wrong track? 6. If the mayoral election held today – would you vote for a democrat, republican or independent? 7. Would you definitely, probably, or lean slightly towards for a (insert which was selected for the last question) candidate? Will you definitely vote, probably vote or lean slight to voting for (insert name picked above)? Who in the list is your 2nd choice? 6. Is a candidate with a 5-point plan that: reduces waste; creates transparency, adds more affordable housing, reduces property taxes, increases public & private partnerships someone that you are more or less likely to vote for? With party are you registered with? Would you consider yourself liberal, moderate or conservative? What is the ancestry that you most identify with? Of all calls that you receive are the always on your cell phone, on both your cell phone and landline, always on your landline.